If you stick to the eastern side of Howard County, you won’t see anything rural about it. Aside from the swath of forest along the Patapsco River to the northeast, where the Patapsco Valley State Park straddles the county line, the area is well developed. Businesses and residential neighborhoods cluster along the Interstate 95 corridor stretching from Baltimore to Washington, D.C., including Hanover, Elkridge, Jessup, Savage, and North Laurel. Two other major thoroughfares parallel I95 to the east: U.S. Route 1 and, in Anne Arundel County, Maryland Route 295, the Baltimore-Washington Parkway. These three key connectors funnel large amounts of traffic between the two cities and serve all points in between. To the west of I95, one more key highway runs roughly north-south: U.S. 29, which connects Ellicott City with Columbia and communities to the south, eventually passing through Silver Spring and into the heart of Washington. But one or two miles west of U.S. 29, the population begins to thin out, and you enter the rural side of Howard County. Here you’ll find less residential housing and more active farmland. This isn’t the Midwest, with its vast tracts of open fields and ten or fewer souls per square mile, but the farms are there. 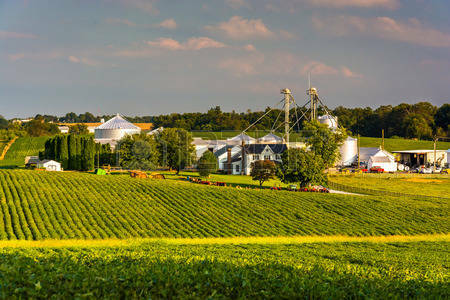 According to Howard County’s Economic Development Authority, one-quarter of the county’s land is farmland, supporting agricultural sales in excess of $200 million annually. The U.S.D.A. offered a rather lower estimate in 2012, although the county may have been including sales other than crops and livestock, the only items the U.S.D.A considered. For example, horses are big business in Maryland, home of the Preakness Stakes, and Howard County has more horses per acre than any other county in the country. Boarding and training services surely bring in a lot of cash. In some of these less developed areas, expensive housing has replaced farmland. West Friendship (which readers of my novel True Death will recognize as the general area where Sandra Peller was killed in a hit-and-run) attracted a fair bit of this sort of development, as has Clarksville and some other areas. Other locales feature more ordinary housing, particularly those strung along the major north-south state routes: 32, 97, and 94. Fields and pastures fill in the gaps between these residential areas, as can readily be seen in satellite photos of the county. But those fields don’t go on for miles and miles. Before too long, you’ll hit another cluster of housing. Way out in the northwest corner of the county, there is a curiosity. Here, the county lines intersect in a very strange way. 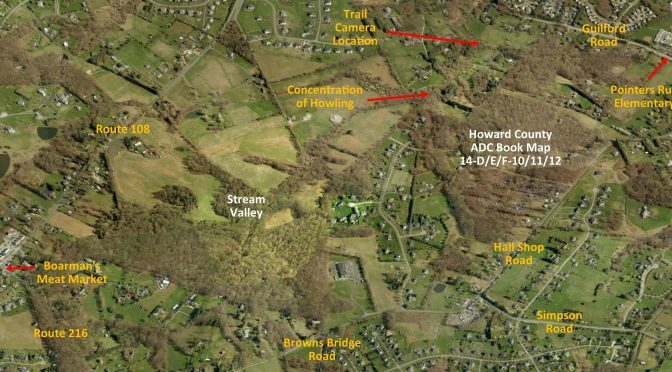 The northern boundary of Howard County tracks westward along the south branch of the Patapsco river to its headwaters in an underground pond called Parr’s Spring. Parr’s Spring is, roughly speaking, the meeting point of four Maryland counties: Howard, Carroll, Frederick, and Montgomery. But Montgomery County’s boundary forms a spike thrusting northeastward toward the spring until it vanishes in a point a bit short of that spot. As a result, there are one or two properties that, according to the maps at any rate, straddle the three counties of Howard, Montgomery, and Frederick. I’ve wondered for several years now how those people are billed for property taxes! Ellicott City, Maryland is the seat of Howard County, the location of the HCPD’s Northern District Headquarters, where my detectives are based, and the home of Detective Lieutenant Rick Peller. In all honesty, Peller’s neighborhood is entirely fictional. If it existed, it would have been built in the 1940’s, a neighborhood of moderately large two-story homes abutting commercial areas reminiscent of small-town main streets, featuring mom-and-pop stores and restaurants. In fact, Main Street in Ellicott City’s historic district could almost be next door to Peller’s house, except for a little problem with the geography, which we’ll get to in a moment. But first, some history. 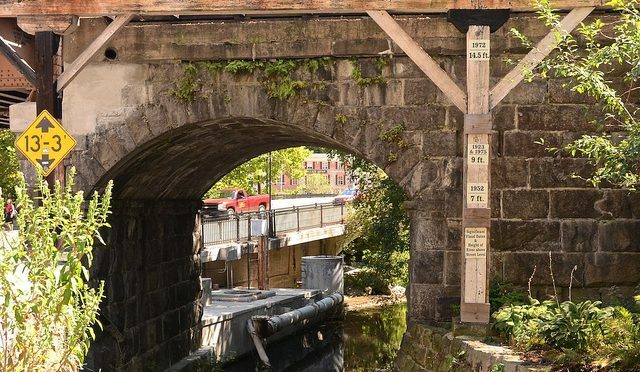 Ellicott City grew up on the banks of the Patapsco River. It was born April 24, 1771 as Ellicott’s Mills, established by the Quaker brothers John, Andrew, and Joseph Ellicott. The Ellicotts chose the location in the wilderness a few miles upstream from Elk Ridge Landing (now Elkridge, Maryland) as the site for a flour mill. Over time, the brothers expanded their operations to sawmills, grain mills, an oil mill, smithies, stables, and a grain distillery. They also transformed agriculture in the area by encouraging local farmers to plant wheat instead of tobacco–after all, they couldn’t mill tobacco–and introducing Plaster of Paris fertilizer to rejuvenate the soil. In 1830, Ellicott’s Mills was chosen as the first terminus of the Baltimore and Ohio (B&O) Railroad outside the city. (Want to talk like a local? Folks around here often call it “Baltimore City” or just “the city” to distinguish it from Baltimore County, which is an entirely separate entity.) Today, the Ellicott City Station together with the gray granite Oliver Viaduct has been designated a National Historic Landmark. It’s the oldest surviving railroad station in America. Ellicott’s Mills became Ellicott City in 1867 with an incorporation charter, which was later lost in 1935. It remains unincorporated today, but is now the seat of the Howard County government. For more historical information, see this article. Back to that geographical quirk I mentioned. The center of Ellicott City is its historic district, built in the Tiber River valley. The Tiber is a tributary of the Patapsco, which in turn is a key tributary of the Chesapeake Bay. The Tiber cuts through the piedmont, slashing a deep gash through the hills. It’s a picturesque area. The oldest buildings in the city are found here, but the valley is narrow, so most residential areas are above in the surrounding high ground. That’s one reason the Peller residence isn’t just around the corner. Another, more serious reason: huge amounts of water can course through the Tiber valley into the Patapsco. Significant rainfalls can raise the level of both rivers, backing the water up into the historic district. In more recent times, development has paved over natural drainage and channeled water down into the center of the city. Devastating floods occurred in 1817, 1837, 1868, 1901, 1917, 1923, 1938, 1942, 1952, 1956, 1972 (Hurricane Agnes), 1975 (Hurricane Eloise), 1989, 2011, and 2016. Peller’s imaginary neighborhood isn’t in the path of these floods, although in my fourth Howard County novel he gets to experience one up close and personal. Main Street becomes Frederick Road as it travels west. It does indeed connect to the city of Frederick at the foot of the Appalachian Mountains. But today westward movement is better facilitated by U.S. Route 40 (Baltimore National Pike), and Interstate 70, both of which run by to the north of Ellicott City. Route 40 is a main commercial drag, particularly to the west of Baltimore. Consequently, it shows up with some frequency in my novels. So does the north-south U.S. Route 29, which connects I70 to Ellicott City, Columbia, and the northern D.C. suburb of Silver Spring. In spite of these and other major traffic arteries, getting around Howard County can take time. The hills force roads to twist and turn, unlike the straight shots in the midwestern areas where I grew up. In any case, if you’re ever in the area, drop by for a visit. And if you happen to bump into Rick Peller, tell him I said hello.